B-Breaker TM (Brown Rice Syrup, Natural Almond Butter [Dry Roasted Almonds, Sea Salt], Honey), Organic Rolled Oats, Brown Rice Flour, Rice Crisps (Rice Flour, Rice Malt, Salt), Non-GMO Brown Rice Protein, Flaxseed Meal, Evaporated Cane Juice, Sea Salt. Made on equipment that also processes nuts. Rice nectar (brown rice, water), almond butter (almonds, sea salt), organic gluten free oats, honey, non-GMO brown rice protein, bing cheeries, dark chocolate chips (cocoa, cocoa butter, cane sugar), flaxseed meal, sea salt, almaretto flavor. B-Breaker™, rice nectar, organic gluten free oats, honey, coconut oil, brown rice flour, non-GMO brown rice protein, apples (freeze dried apples), brown rice crisps (brown rice, rice nectar, sea salt), ground chia seed, ground cinnamon, natural apple flavor, sea salt. Store in cool, dry place for ultimate freshness. Gluten free oats, brown rice syrup, coconut oil, organic honey, brown rice flour, blueberries (freeze dried blueberries), crisp rice (rice flour, sugar, salt, calcium carbonate), flaxseed, rice protein concentrate, natural flavor, sea salt. B-Breaker™ (brown rice syrup, gluten free oats, brown rice flour, non-GMO brown rice protein, honey) blueberries (freeze dried), coconut oil, brown rice crisps (brown rice, brown rice syrup, sea salt), flaxseed meal, evaporated cane juice, sea salt. 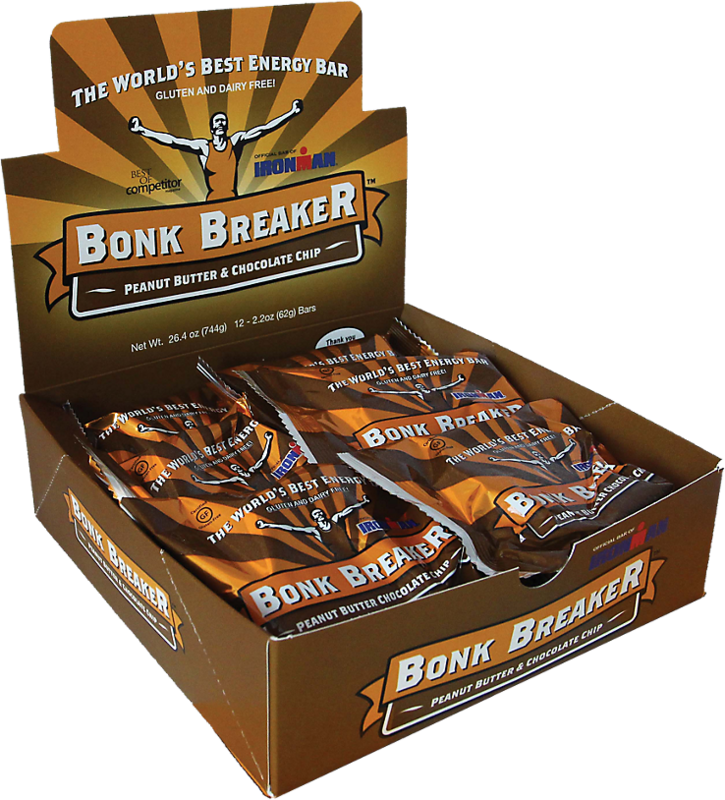 Bonk Breaker Protein Blend (Pasture Raised Collagen Hydrolysate, Grass Fed Whey Concentrate, Milk Protein Isolate, Whey Protein Isolate), Non-GMO Prebiotic Fiber, 85% Cacao Chocolate Chips (Cocoa Mass, Sugar, Cocoa Butter, Vanilla), Whey Protein Crisps (Whey Protein Concentrate, Rice Flour), Dates, Water, Sunflower Oil, Cocoa, Almond Butter, Natural Flavors, Sunflower Lecithin, Sea Salt, Stevia. B-Breaker™, brown rice syrup, organic gluten free oats, honey, brown rice flour, coconut oil, non-GMO brown rice protein, dark chocolate chip (cocoa, sugar, cocoa butter, vanilla extract), brown rice crisps (brown rice, brown rice syrup, sea salt), flaxseed meal, espresso (ground espresso beans), evaporated cane juice, sea salt. Brown rice syrup, cashews, gluten-free oats, brown rice flour, organic honey, organic dark chocolate chips (organic cane sugar, organic chocolate liquor, organic cocoa butter, soy lecithin, organic vanilla), rice protein concentrate, crisp rice (rice flour, sugar, salt, calcium carbonate), flaxseeds, natural flavors, sea salt. B-Breaker TM (Brown Rice Syrup, Natural Crunchy Peanut Butter [Peanuts, Salt], Honey), Organic Rolled Oats, Brown Rice Flour, Rice Crisps (Rice Flour, Rice Malt, Salt), Non-GMO Brown Rice Protein, Flaxseed Meal, Natural Banana Flavor, Evaporated Cane Juice, Sea Salt. B-Breaker™ (rice nectar, natural crunchy peanut butter [peanuts, salt], honey), organic gluten free oats, brown rice flour, strawberry jam (strawberries, fruit pectin, cane syrup), rice crisps (rice flour, rice nectar, salt), non-GMO brown rice protein, flaxseed meal, sea salt. Contains peanuts. Made on equipment that also processes nuts. B-Breaker™ (rice nectar, natural crunchy peanut butter [peanuts, salt], honey), organic gluten free oats, brown rice flour, chocolate chips (cocoa, cocoa butter, cane sugar, vanilla extract), rice crisps (rice flour, rice nectar, salt), non-GMO brown rice protein, flaxseed meal, sea salt. Peanut Butter, Bonk Breaker Protein Blend (Pasture Raised Collagen Hydrolysate, Grass Fed Whey Protein Concentrate), Non-GMO Prebiotic Fiber, Clover Honey, Dark Chocolate Chips (Unsweetened Chocolate, Cane Sugar), Whey Protein Crisps (Whey Protein Concentrate, Rice Flour), Non-GMO Soluble Tapioca Fiber, Sunflower Lecithin, Sea Salt, Stevia, Cashew Butter. 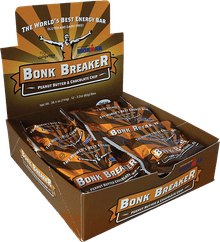 The World's Best Energy Bar!